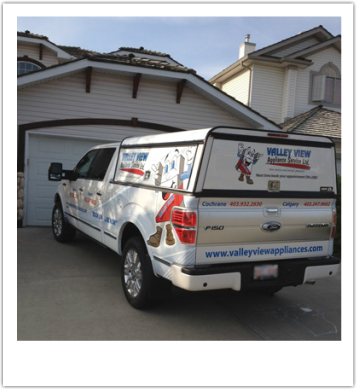 Valley View Appliances has been providing dependable appliance repair service and installation in the Calgary area since 1995. At Valley View, we believe that everyone deserves trustworthy service for their home appliances. All service is proudly guaranteed and performed by our certified technicians. Our excellent team currently has over 50 years of accumulated experience in care and repair of home appliances. We are pleased to serve Calgary and surrounding areas including Cochrane, Airdrie, Bearspaw, Springbank, and many others. All of our technicians are authorized to perform in-warranty and out-of-warranty appliance service for many of the major appliance manufacturers. Because of our authorized warranty certification, we are always current with industry standards and constantly excelling at fixing your appliance right the first time. ​We pride ourselves in providing trustworthy service at a reasonable rate. All of our service vehicles are fully-stocked, so that in most cases, we can finish repairs on our first visit. Our technicians take pride in a job well done and take great care to respect your home and property. We try our best to make your repair a quick and pleasant experience, knowing that a satisfied customer is a repeat customer. We guarantee that all our parts are original equipment manufacturer (OEM) which means better parts for our customers. All work is fully guaranteed - 90 days for parts and 30 days for labour. The Better Business Bureau has highlighted our great service with this video.